The World Nomad Games are organised with a view to preserve and promote ethnic sports which are an inseparable element of the Central Asian pastoral tradition. Football and athletics too mainstream for you? How about some Dothraki-style falconry, horse-riders on fire, goat-carcass polo and stick wrestling just the way Genghis Khan used to do it? The world championship for these sports was recently concluded in Cholpon-Ata, in the mountainous Central Asian country of Kyrgyzstan. The World Nomad Games are organised with a view to preserve and promote ethnic sports which are an inseparable element of the Central Asian pastoral tradition. With a history of nomadic living that goes back almost two millennia, the Central Asian countries of Kyrgyzstan, Turkmenistan, Tajikistan, and other constituent countries of the erstwhile Soviet Union participate in these games, along with enthusiastic participation from faraway countries like the United States of America, Italy and the Republic of Congo! The fierce game of Kok-boru, where players on horseback compete for a goat carcass. Falconry, because hunting for your food yourself is so basic! Artists in traditional finery showcasing stunts on horseback. Chynara Madinkulova participating in the Traditional Archery event. Fierce competitors enjoying a pleasant meal together. It’s not all rivalry you know! 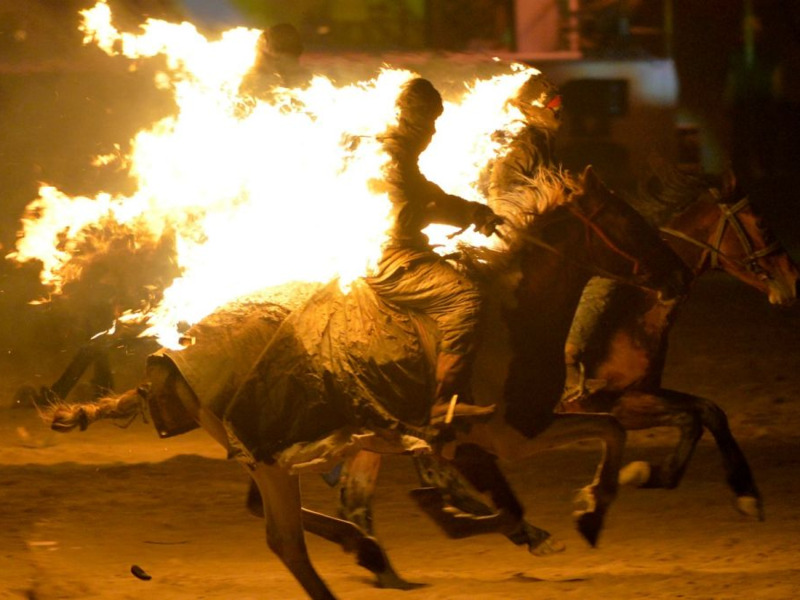 The horse-riders on fire we spoke about! Now that’s what we call a spectacle! All images sourced from tumblr and theguardian.